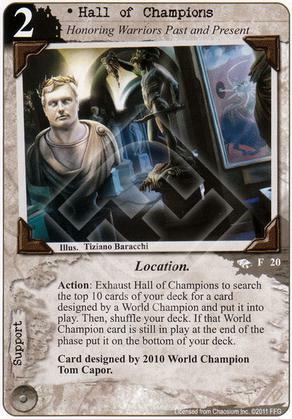 Flavor Text: Card designed by 2010 World Champion Tom Capor. Is there a list of all the Champion cards that have been Published in the LCG format? Missing 2006 (? ), 2008, 2011 (? ), and 2012. Harry Houdini is the 2008 card. The Mage's Machinations is the 2011 card, post-errata. mentor to vaughn is the 2006 card. 1) If you trigger this, and there is one or more Champion cards in the ten, must you put one of these into play? 2) Can you fetch the Archmage attache ? 1) Yeah, I think so. I'm trying to imagine the situation where you wouldn't want to, and I'm coming up a little empty. If what you found was a second copy of the Hall of Champions, you wouldn't be allowed to. 2) I think The Festival (Liege Champion) and The Archmage's Attache (North American Champion) are both ineligible. Of the possible targets (not counting the Hall itself), 6 out of 7 are sorcerers, and five of these are unique. All are neutral except for 2 Miskatonic and 1 Yog-Sothoth. When you're told to "search" your deck in other games (like Magic, for instance), you're not actually forced to find an eligible card. I think if Hall of Champions told you to "reveal" 10 cards, that might be different. But since the Hall doesn't make you show the 10 cards you're looking through, there's no way for your opponent to enforce the outcome of your search. I can see how you might not want to find a copy of The Mage's Machinations because you have some valuable character on the board that you can't afford to lose.